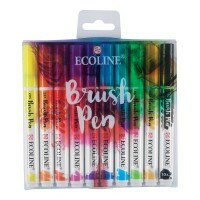 Ecoline Brush Pens are filled with Ecoline Liquid Watercolour Ink and are currently available in 54 colours plus one colourless blender. This set contains 5 brush pens in the following colours:Lemon Yellow, Yellow Ochre, Deep Orange, Scarlet, Magenta, Blue Violet, Ultramarine Deep, Sky Blue (Cyan), Black, Green. 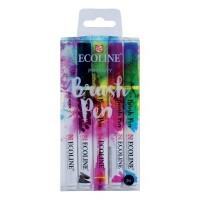 Ecoline Brush Pens are filled with Ecoline Liquid Watercolour Ink. 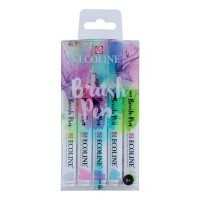 This set contains 5 brush pens in the following colours: Lemon Yellow, Magenta, Sky Blue (Cyan), Black and a colourless blender. 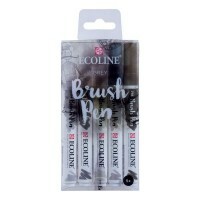 Ecoline Brush Pens are filled with Ecoline Liquid Watercolour Ink. This set contains 5 brush pens in the following colours: Grey, Deep Grey, Warm Grey Light, Cold Grey, Warm Grey. 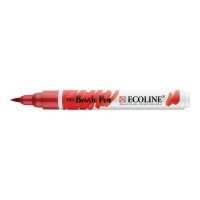 Ecoline Brush Pens are filled with Ecoline Liquid Watercolour Ink. 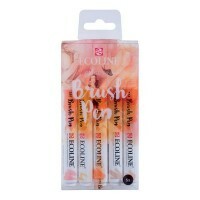 This set contains 5 brush pens in the following colours: Pastel Red, Sepia Light, Apricot, Beige, Pink Beige.